add the mince and stir through until lump free. 1tsp garlic paste, cook through and add chopped tomatoes, and tomato paste, add sliced peppers and cook through. ( you can add mixed vegetables if you prefer) . 3 tbls butter melted, stir in 3tbls flour and stir in 3 cups milk. Bring to the boil, stirring until it thickens to a thin custard consistancy. 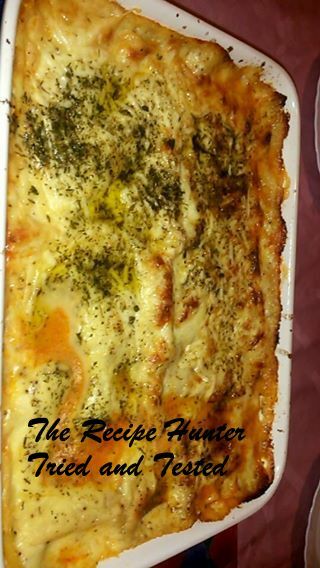 Layer lasagne sheets in a pyrex, add 1 cup white sauce, and half the mince, add another layer of lasagne sheets, white sauce and mince, finish with lasagne sheets and white sauce.